I recently saw this “‘nzeppeled/jewel-ised version of Irradial and wanted to use it before I forget about it. Pickpocket did take a little time to practice but it’s really worth it, I love the weaving effect a lot! And yes, I confess: I did use a ruler to place the dots this time. O:-) I like it tidy as it is here – although the Diva’s wavy interpretation is really cool, too. Do check it out if yiou haven’t already seen it and of course all the other great contributions to this week’s challenge! Click here to go to the Diva’s post to see it all. Have a great week and lots of fun with Pickpocket! Posted on 4. 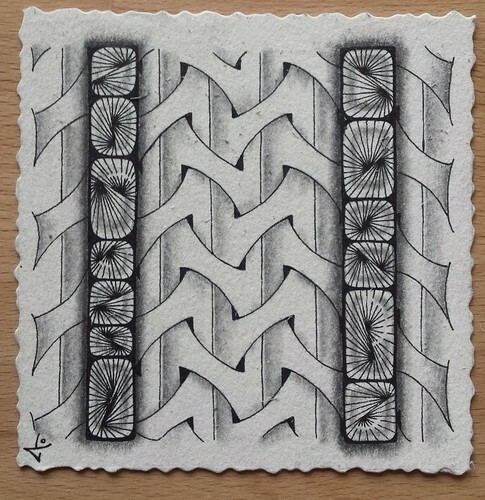 April 2018 by Yvonne LiPosted in challenge, Diva Challenge, ZentangleTagged challenge, thediva, Zentangle. Next Next post: Diva Challenge #358: Pickpocket again! Your tile demonstrates an amazing command of both tangles. I just started following Tomas on Instagram. His deconstructions are intriguing. Have you been able to resolve your internet access at home issues?